Note: I originally wrote and published this article as a DigitalOcean Community Tutorial. 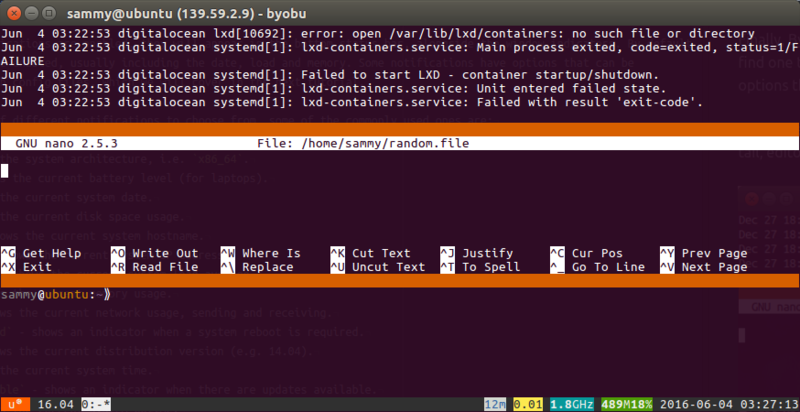 Byobu is an easy-to-use wrapper around the tmux (or screen) terminal multiplexer. This means that it makes it easy for you to open multiple windows and run multiple commands within a single terminal connection. Byobu’s primary features include multiple console windows, split panes within each window, notifications and status badges to display the status of the host, and persistent sessions across multiple connections. These provide you with a lot of different options and possibilities, and it is flexible enough to get out of your way and let you get things done. This tutorial will cover how to install and configure Byobu as well as how to use its most common features. One Ubuntu 16.04 server with a sudo non-root user, which you can set up by following this initial server setup tutorial. Ubuntu should come with Byobu installed by default, so here, we’ll check that it’s installed and then configure some if its settings. 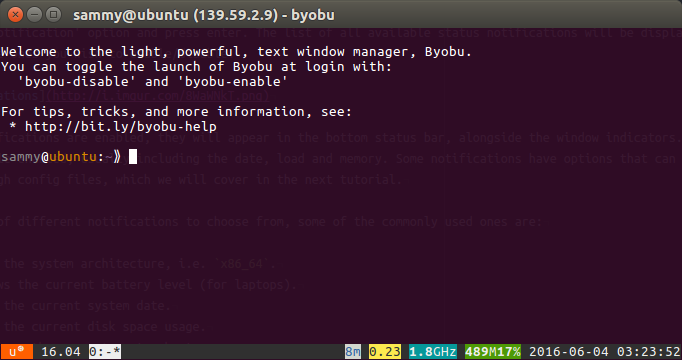 To check that Byobu is installed, try running this command to output its version. If that does not display the current version number, you can manually install Byobu using sudo apt-get install byobu. Now that Byobu is installed, we can configure some options. Byobu is disabled by default after installation. There are two main ways you can enable Byobu: you can manually start it with the byobu command every time you want to use it, or you can set it to start automatically when you log in to your account. To add Byobu to your login profile, run the following command. This means that every time you log in to your account, it will be launched. The Byobu window manager will be launched automatically at each text login. If you change your mind later on and want to disable Byobu on login, run byobu-disable. Because Byobu sessions are maintained across multiple login sessions, if you don’t specifically close a Byobu session, it will be loaded again the next time you log in. This means you can leave scripts running and files open between connections with no problems. You can also have multiple active logins connected to the same session. Once Byobu is configured to start on login if you want it to, you can customize which multiplexer it uses. By default, Byobu will use tmux as the backend multiplexer. However, if you prefer to use screen, you can easily change the enabled backend. This will give you a prompt to choose the backend multiplexer. Enter the number for whichever you prefer, and then press ENTER. This tutorial assumes you have the tmux backend enabled, however, the default keybindings should be the same with screen as well. After this, you’ll need to reload your shell configuration. If you change your mind later on and want to disable Byobu’s colorful prompt, you can run byobu-disable-prompt. Byobu is fully configured now, so let’s go over how to use it. Byobu uses the function keys (F1 through F12, the top row of your keyboard) for the default keybindings which provide access to all of the available functions. In the next few steps, we’ll talk about the keybindings for sessions, windows, and panes. A session is simply a running instance of Byobu. A session consists of a collection of windows, which are basically shell sessions, and panes, which are windows split into multiple sections. One reason to use sessions is because each session can have its own window size, which is useful if you’re connecting with multiple devices with different screen sizes (say, a phone and a desktop computer). Another reason to use sessions is simply to have a clean workspace without closing your existing windows. First, SSH into your server and enable Byobu, if it isn’t already enabled from the previous steps. Start a new session by pressing CTRL+SHIFT+F2, then use ALT+UP and ALT+DOWN to move backwards and forwards through your open sessions. You can press CTRL+D to exit Byobu and close all of your sessions. If you instead want to detach your session, there are three useful ways to do this. Pressing F6 cleanly detaches your current session and logs you out of the SSH connection. It does not close Byobu, so the next time you connect to the server, the current session will be restored. This is one of the most useful features of Byobu; you can leave commands running and documents open while disconnecting safely. If you wish to detach the current session but maintain an SSH connection to the server, you can use Shift-F6. This will detach Byobu (but not close it), and leave you in an active SSH connection to the server. You can relaunch Byobu at any time using the byobu command. Next, consider a scenario where you are logged into Byobu from multiple locations. While this is often quite a useful feature to take advantage of, it can cause problems if, for example, one of the connections has a much smaller window size (because Byobu will resize itself to match the smallest window). In this case, you can use ALT+F6, which will detach all other connections and leave the current one active. This ensures only the current connection is active in Byobu, and will resize the window if required. CTRL+SHIFT+F2 will create a new session. ALT+UP and ALT+DOWN` will scroll through your sessions. F6 will detach your current Byobu session. SHIFT+F6 will detach (but not close) Byobu, and will maintain your SSH connection to the server. You can get back to Byobu with the byobu command. ALT+F6 will detach all connections to Byobu except for the current one. Next, let’s explore one of Byobu’s features: windows. Byobu provides the ability to switch between different windows within a single session. This allows you to easily multi-task within a single connection. To demonstrate how to manipulate windows, let us consider a scenario where we want to SSH into a server and watch a system log file while editing a file in another window. In a Byobu session, use tail to watch a system log file. We now have two windows open: one tailing /var/log/syslog and the other in an editor session. You can scroll left and right through your windows by using F3 and F4 respectively. You can also give these windows names so it’s easier to organize and find them. To add a name to your current window, press F8, then type in a useful name (like “tail syslog”), and press ENTER. Scroll through each window and name them. If you want to reorder them, use CTRL+SHIFT+F3/F4 to move the current left or right through the list, respectively. At this point, there should be some log entries in syslog. In order to look through some of the older messages that are no longer being displayed on the screen, scroll to the log window and press F7 to enter the scrollback history. You can use Up/Down and PageUp/PageDown to move through the scrollback history. When you are finished, press ENTER. Now, if you need to disconnect from the server for a moment, you can press F6. This will clearly end the SSH connection and detach from Byobu. When it has closed, you can use SSH to reconnect again, and when Byobu comes back, all three of our existing windows will be there. F2 creates new windows within the current session. F3 and F4 scroll left and right through the windows list. CTRL+SHIFT+F3/F4 moves a window left and right through the windows list. F8 renames the current open window in the list. F7 lets you view scrollback history in the current window. Using just a few options, you have performed a number of useful actions that would be hard to easily replicate with a single standard SSH connection. This is what makes Byobu so powerful. Next, let’s extend this example by learning how to use panes. Byobu provides the ability to split windows into multiple panes with both horizontal and vertical splits. These allow you multi-task within the same window, as opposed to across multiple windows. Create horizontal splits in the current window panel by pressing SHIFT+F2, and vertical ones with CTRL+F2. The focused pane will be split evenly, allowing you to split panes as much as is required to create quite complex layouts. Note that you cannot split a pane if there is not enough space for the pane to split into two. Once you have split a window into at least two panes, navigate between them using SHIFT+LEFT/RIGHT/UP/DOWN or SHIFT+F3/F4. This allows you to leave a command running in one pane, and then move to another pane to run a different command. You can reorder panes by using CTRL+F3/F4 move the current pane up or down, respectively. SHIFT+ALT+LEFT/RIGHT/UP/DOWN allows you to manipulate the width and height of the currently selected pane. This will automatically resize the surrounding panels within the window as the split is moved and makes it easy to make a pane a lot larger when you are working in it, and then enlarge a different pane when your focus has shifted. You can also zoom into a pane with SHIFT+F11, which makes it fill the entire window; pressing SHIFT+F11 again switches it back to its original size. Finally, if you want to split a pane into a completely new window, use ALT+F11. SHIFT+F2 creates a horizontal pane; CTRL+F2 creates a vertical one. SHIFT+LEFT/RIGHT/UP/DOWN or SHIFT+F3/F4 switches between panes. CTRL+F3/F4 moves the current pane up or down, respectively. SHIFT+ALT+LEFT/RIGHT/UP/DOWN resizes the current pane. SHIFT+F11 toggles a pane to fill the whole window temporarily. ALT+F11 splits a pane into its own new window permanently. Now that you know how to use sessions, windows, and panes, we’ll cover another one of Byobu’s features: status notifications. Status notifications are notifications in the status bar at the bottom of a Byobu screen. These are a great way to customize your Byobu experience. Press F9 to enter the Byobu configuration menu. The options available are to view the help guide, toggle status notifications, change the escape sequence, and toggle Byobu on or off at login. Navigate to the Toggle status notification option and press ENTER. The list of all available status notifications will be displayed; you can select the ones you wish to enable or disable. When status notifications are enabled, they will appear in the bottom status bar, alongside the window indicators. By default there are a couple enabled, usually including the date, load and memory. Some notifications have options that can be configured through config files, which we will cover in the next tutorial. arch shows the system architecture, i.e. x86_64. `battery shows the current battery level (for laptops). date shows the current system date. disk shows the current disk space usage. hostname shows the current system hostname. ip_address shows the current system IP address. load_average shows the current system load average. memory shows the current memory usage. network shows the current network usage, sending and receiving. reboot_required shows an indicator when a system reboot is required. release shows the current distribution version (e.g. 14.04). time shows the current system time. updates_available shows an indicator when there are updates available. uptime shows the current system uptime. whoami shows the currently logged in user. After selecting the status notifications you wish to enable, select Apply. You may need to press F5 to refresh the status bar; an indicator in the status bar will appear, if required. Status notifications are a great way to see the information you care about in your system at a glance. SHIFT+F1 displays the full list of keybindings. If you forget every other keybinding, just remember this one! Press q to exit. SHIFT+F12 toggles whether keybinding are enabled or disabled. This comes in handy if you are trying to use another terminal application within Byobu that has conflicting keyboard keybindings. CTRL+F9 opens a prompt that lets you send the same input to every window; SHIFT+F9 does the same for every pane. As you can see from the wide range of functions that we have covered, there are a lot of things that Byobu can do and there is a good chance that it will fit into your workflow to make getting things done easier.